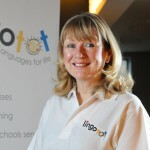 South Wirral & Ellesmere Port Lingotot Centre | French and Spanish classes for kids. MFL PPA cover. My name is Jackie Lewis, mum to an 11 yr old daughter and I have been running Lingotot Spanish & French classes for over 2 yrs in the South Wirral & Ellesmere Port area. I have a degree in Spanish and French and I am a trained Modern Foreign Languages teacher with 16 years experience working in grammar, comprehensive and independent schools. I have also spent a year overseas in Singapore teaching English as a Foreign Language. I have always longed to teach younger children and working abroad convinced me of the benefits of beginning a second language at a much younger age. Lingotot has given me the opportunity to do this, as well as achieve a much better work/life balance. Lingotot sessions are great fun, packed full of interactive songs, games, stories and craft. The sessions are almost entirely conducted in the target language and you can learn along with your little ones! I look forward to welcoming you to one of our free taster sessions soon!